MONTREAL - Even though it has yet to confirm it is coming to Canada, Verizon is already having a major influence on the cellphone market here. Canadians need look no further than new data-sharing plans that made their debut this summer in what is generally seen as a response by Canadian wireless companies to the looming threat of competition from the U.S. telecom giant. Rogers (TSX:RCI.B), Telus (TSX:T) and Bell (TSX:BCE) now all offer data-sharing plans that allow mobile phone and tablet users in a household to share one data package with a set amount of monthly data usage to do things like surf the Internet. Telecom analyst Iain Grant said the response to Verizon's potential move into the Canadian market has made the major telecoms "sharpen their pencils and start giving Canadians better deals." "This all came about mostly as the spectre of Verizon looming over the Canadian market place," said Grant, managing director of the SeaBoard Group. "In the U.S., they've recognized many accounts, many households and (given) them a data-sharing plan." Big carrier Verizon, which has about 100 million subscribers, has been offering shared data plans for more than a year and other major carriers such as AT&T and Sprint have followed suit. There were predictions earlier this summer that Verizon was considering entering the Canadian market when it reportedly made an initial offer for Wind Mobile and started talks with Mobilicity, two smaller wireless companies. But the Globe and Mail recently reported that Verizon is putting off a potential acquisition of new players and may only participate in the January 2014 auction for wireless spectrum, which will see telecom companies bidding on radio waves needed to make cellphone networks operate. Meanwhile, the introduction of two-year contracts brings Canada in line with most other countries. The big three carriers have launched them for the important back-to-school and holiday seasons as they move consumers away from three-year contracts in advance of new rules set by the CRTC, Canada's telecommunications watchdog, that take effect on Dec. 2. Three-year cellphone contracts were a hot-button issue for many Canadians, who complained to the CRTC that they were locked into the contracts for too long and missed the launch of upgrades for new smartphones. Telus CEO Darren Entwistle noted the two-year price plans his company has launched are similar to what Verizon offers in the U.S. market and might not mean prices will go lower if Verizon comes to Canada. "So I think it's less likely that there's going to be a price war," Entwistle said recently. Analyst Troy Crandall said shared data plans on multiple smartphones and tablets would most benefit households with three or more members, but they would have to make sure they didn't go over their monthly data limit. Crandall noted, however, that with a two-year contract, both the amount consumers pay up front for their device and monthly rates have risen slightly. "I would take all of these prices (offered) as being suggested prices and everything is negotiable," said Crandall, of investment firm MacDougall, MacDougall and MacTier in Montreal. Telus said that, with a family of four, the new prices would see parents pay $55 each a month for the latest iPhone, children charged $35 each for their mobile phones, and the family receiving features such as unlimited talking and texting. Adding a tablet to the plan would cost $10 a month, while the cost of a three-gigabyte data plan would be $50. The total monthly bill would be approximately $240, instead of five separate bills under its two-year "SharePlus" plans. Telus said savings would depend on what the family had previously subscribed to. Rogers spokeswoman Patricia Trott said the increase in the average monthly plan ranges from $5 to $15 on a two-year contract. The $15 includes the addition of Canada-wide long distance talk and text, she said. Consumers are now paying off their smartphones over two years instead of three and that means the price goes up, she said. "When you do the calculation, the pricing has to go up per month if you're going to make up for the cost of the phone. The cost of the phone doesn't change," Trott said. For example, an iPhone 5 costs $699. Telus is asking consumers to put down $199 on the phone, comparable to Verizon or AT&T, up from $179, said Brent Johnston, president of mobility solutions at Telus (TSX:T). That leaves a balance of $500 over 24 months, which works out to $20.83 — a monthly increase of $6.40, he said. Bell's Claire Gillies said subsidies to help buy smartphones have always been important to consumers. 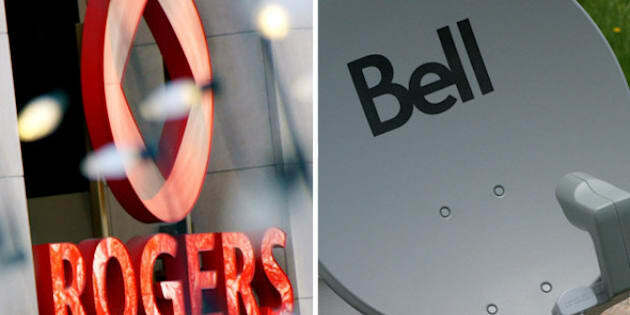 "It's been our findings over 28-some years of our history that customers have chosen a lower upfront price and preferred to pay a little bit more each month as a model," said Gillies, vice-president of marketing campaigns at Bell (TSX:BCE).